In this compelling new tip book you'll find innovative and surprising ways to keep your personal diversity journey moving and the diversity commitment of your organization. Written to make this information bite-size and accessible, you'll find quick answers to typical What should I do? questions, like: What if I say the wrong thing, what should I do? What if I am work and someone makes a sexist joke, what should I say? 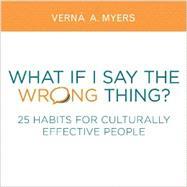 Purchase copies for everyone at your organization to make sure everyone knows the culturally effective way to approach diversity situations. With this book they can be prepared and practiced at moving diversity forward! Verna Myers, Esq., principal of Verna Myers Consulting Group, LLC (VMCG), is a nationally recognized expert on diversity and inclusion within law firms, law departments and law schools. A highly sought after speaker at numerous conferences worldwide, Verna sponsors her own successful annual Opus Conference on Race and Ethnicity in Large Law Firms.